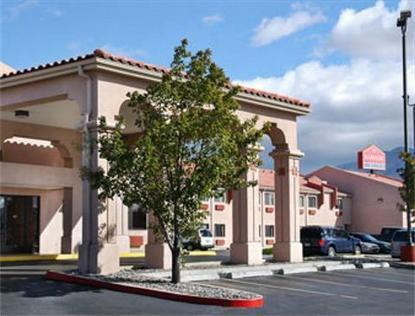 The Ramada Limited Albuquerque serves the Albuquerque, Rio Rancho, and Bernalillo areas from its location at I-25 and Alameda. The hotel features easy on-off access to interstate I-25 and the shops, restaurants, and businesses that are located in the Alameda and Corrales roads area. We've all heard about the world famous Albuquerque Balloon Fiesta. The Ramada Limited Albuquerque is just a mile from the Albuquerque Balloon Fiesta Park, and only 2 miles from the Sandia Casino and Golf Club. The Sandia Peak Tramway is just 5 miles away, and the wide of variety of restaurants that are located on I-25 are just minutes away. From the minute you walk in the front doors and experience the beautiful SouthWestern ambience of the hotel lobby and breakfast area, you know that you are in for a special treat, as this hotel was a 2004 Ramada Pinnacle Award winner. The luxurious indoor pool, jacuzzi, and sauna are just off the lobby and available year-round. Our Ramada signature Continental Breakfast is free to all guests and coffee is always available 24 hours a day. We have just updated our rooms with the famous new Ramada Citrus Ginger bath amenities, and the new shower curtains, curved curtain rods, and Moen Revolution showerheads that are creating the ultimate bath experience for our guests. You'll also love our new beds, pillows, and the best night's sleep you've had for a long while. Come and find out why we are the first choice of travelers seeking hotel accomodations in Albuquerque, Rio Rancho, and Bernalillo.